It is a tossup between Feldspar and fluorite on which is my favorite rock to polish. I like the nice sheen that I get when I polish Fluorite, but like the colors and different patterns found in Feldspars. Some of the feldspar I find is quite similar to various jaspers, but I don't get the nice mirror like polish on feldspars that I get with jaspers because of the lower percentage of silica in the feldspars. Jasper is mostly silica, which is harder that feldspars. Jaspers are around 7 on mohs scale of hardness where feldspars are around 6. This is a feldspar cabochon, there is a wide variety of color in this cab, white, yellow, tans, browns, greens and reds. 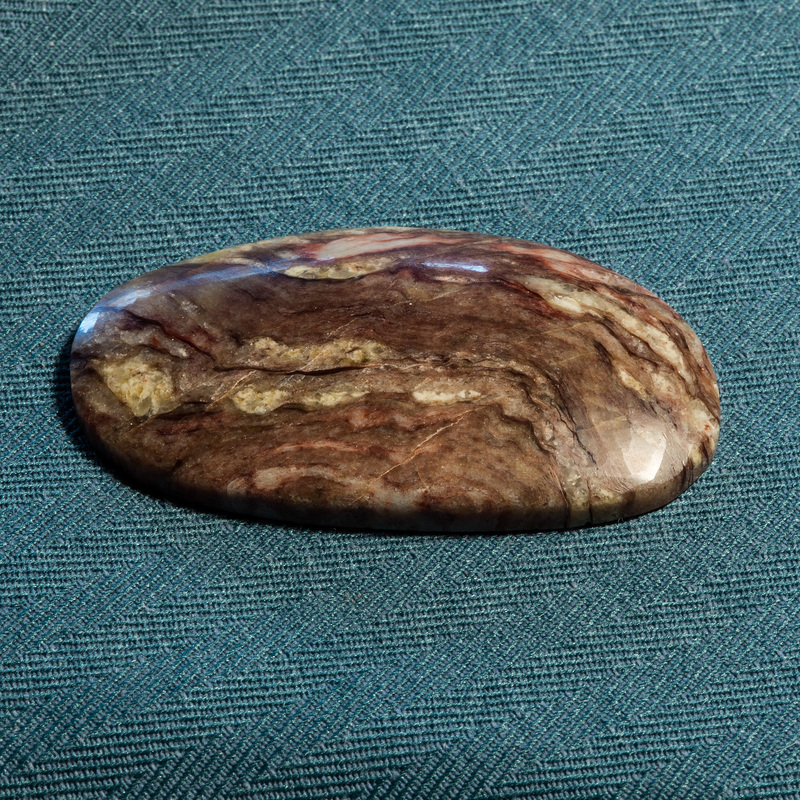 This cabochon is 1/4 thick, 1 -1/2" wide and 2-1/4" long, quite large for a feldspar cabochon. Feldspar normally has fractors throughout the rough and is hard to saw without having the rough piece break apart. The pegmatite on Killpecker ridge has a lot of green microline feldspar, it might be a variety of Amazonite. The blue-green Amazonite gets its color from small amounts of lead, chromium and other minerals can cause the feldspar to have greenish - blue colors. Feldspars are a group of rock-forming tectosilicate minerals that make up as much as 60% of the earths crust. Feldspars crystallize from magma as veins in both intrusive and extrusive igneous rocks and are also present in many types of metamorphic and sedimentary rock. Feldspar is used in glassmaking, ceramics paint, plastics and rubber. About 630 tons of feldspar was mined in 2012 with a value of about 39 million dollars. The United States imported only two ton of feldspar in 2012. Sadly the United States imports most commodities that are made with feldspar as a finished product, like glass, enamel wares and fluxes.